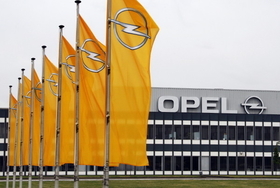 GM's plans to close an Opel plant in Antwerp (shown), but Europe still faces significant overcapacity in its car plants. (Bloomberg) -- General Motors Co.'s 1,300 workers in Antwerp, Belgium, are fighting for their jobs, hoping for a white knight to rescue the factory from closure. Antwerp is an anomaly. Not a single European automobile plant closed during the recession, while 18 assembly factories have been shuttered in the U.S. since 2008. European governments prevented the biggest automakers from firing workers and used subsidies to prop up sales. Now that most of the incentives have expired, executives must find ways to cope with a slump in demand as they gather at the Paris auto show this week. European capacity use will probably be surpassed by the United States this year for the first time since 2006, IHS Automotive estimates. North American plants will on average use 72 percent of capacity, up from 51 percent in 2009. The average for Europe may climb to 68 percent, boosted by demand from China. An automaker typically needs at least 80 percent utilization for a plant to be profitable, the researcher says. With GM and Chrysler Group leading the U.S. plant closures as part of their bankruptcy reorganizations last year, improved usage is helping them post profits or pare losses. GM, the biggest U.S. carmaker, earned $2.4 billion in the first half. Chrysler, run by Fiat, reduced its losses to $369 million. At 62.8 percent Renault SA, the maker of the Clio compact and Megane family car, has the worst capacity use rate among Europe's volume carmakers, said Carvalho. Fiat S.p.A., Italy's largest carmaker, is at 64.8 percent and PSA/Peugeot-Citroen SA, France's biggest, is at 67.4 percent. European capacity this year, including Russia where carmakers have built plants recently, is at about 27.5 million cars, IHS's Carvalho said. By contrast, Ford Motor Co. said last month that Europe's new car sales may fall to as low as 14.5 million vehicles this year from 15.9 million in 2009. The European usage rate will likely drop in the second half with carmakers forecasting a sales decline in the region as government-funded scrapping programs end. Next year, Fiat will close its Termini Imerese plant in Sicily, which makes the Lancia Ypsilon. CEO Sergio Marchionne is also prepared to shift production of its best-selling Panda model from Poland to the under-utilized Pomigliano plant in Italy and invest 700 million euros in the factory if unions agree to a plan that includes adding shifts and instituting a six-day work week. Pomigliano employs 5,000 workers and produced 35,000 cars last year. Melfi, Fiat's second-biggest Italian plant and the one with the best capacity utilization, employs 5,280 workers and built 280,000 Grande Puntos in 2009. Peugeot said in July that its auto unit may lose money in the second half on the slumping demand. The Paris-based carmaker posted a 680 million-euro ($918 million) first-half profit. After removing a production line last year at its Rennes factory and downsizing other plants, Peugeot is “starting to see the benefits” and plans no further capacity cuts, CEO Philippe Varin said July 28. Renault CEO Carlos Ghosn shed workers during the recession at one of 14 French production sites, in Sandouville, where 1,300 people left in 2008 because of sluggish sales of the Laguna model made at that factory. Volkswagen AG, Europe's largest carmaker, has the best capacity use among the volume producers in the region with a rate of 77.2 percent, helped by booming sales in China, its biggest market. Back in Belgium, workers at the Opel factory, which has cut its operations to one shift a day, hope that their factory is not the first in Europe to close since 2006. In that year, GM shut its site in Azambuja, Portugal, and Peugeot folded its Ryton plant in Coventry, England. Two potential investors are looking at the plant, one of which is an automaker, Van Grinsven said. “I hope it's a 50 percent chance, but I think 30 percent,” he said.